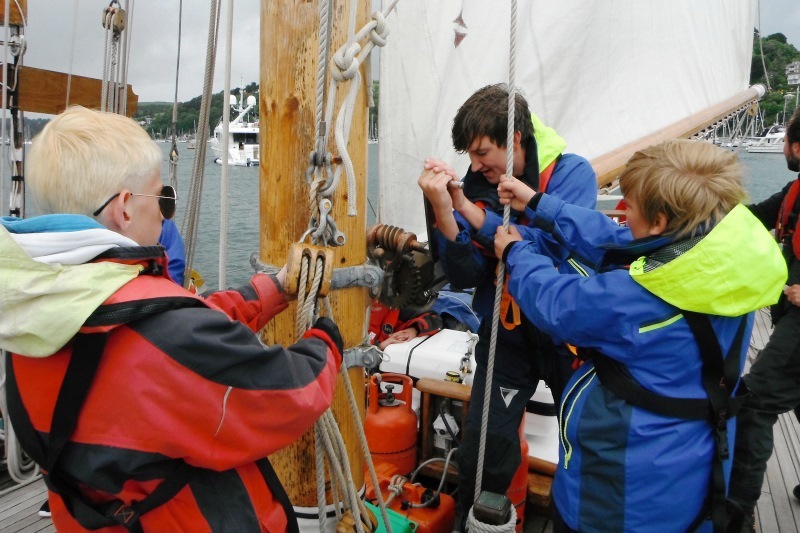 The Island Trust has many years experience of providing challenging sailing expeditions for youth groups, schools and colleges. Our highly trained professional sailing staff will ensure that your group’s residential or day sail is a valuable learning experience as well as an exciting and enjoyable voyage. We have extensive experience of working with groups of young people with special educational needs, moderate learning difficulties and challenging behaviour. We coach sailing to young people with both physical and mental disabilities, and our staff have been trained in teaching those with visual and hearing impairment. Our wooden heritage vessels enable young people to experience ‘living history’ and to understand something of the historic importance of our nation’s maritime past. We also teach the need to conserve the marine environment. Each sailing expedition is tailored specifically to the needs of your group, with consultation between the Skipper and Group Leader, to ensure that we are able to create the optimum learning environment. Most sailing weeks offer the opportunity to work towards an RYA certificate. On an Island Trust voyage young people sail as a crew, cook and eat together. Time with us is so much more than just sailing – many studies have concluded that sailing is a particularly effective and innovative platform for enhancing young lives. It encourages co-operation, a sense of responsibility, instils a sense of adventure, develops initiative, social skills, feelings of self-worth, communication skills and acts as a catalyst to engagement with education and employment. The majority of our sailing takes place around the South West. Voyages start from Plymouth and the young crew may visit Falmouth, Fowey, Dartmouth or Salcombe. Depending on the weather, they may even reach The Isles of Scilly or the Channel Islands. Residential voyages include overnight sailing and two hour watches. Everyone helps to sail the boat. Those who have achieved Start Sailing certificates on previous voyages may work towards an RYA Competent Crew qualification and will be encouraged to consider undertaking more sailing for sport, leisure or professional career. The Island Trust will help to facilitate this for those who discover a passion for the sea. We are a Duke of Edinburgh’s Award Approved Activity Provider and welcome groups seeking to undertake a Silver or Gold DofE Expedition together. The group would need to be 7 participants in total. We also run a number of residential sail training voyages exclusively for home educated students, which follow the same itinerary as our teenage weeks . Contact us for more information. Some groups are more suited to, or prefer, a day sail and we offer these at quieter times or on Saturdays. These are open to groups of all ages, generally up to age 25. Do contact us if you are interested. Our Ocean Discoverability programme for young people is designed for special needs schools and day centres in Plymouth, Devon and Cornwall, including some children with life-limiting conditions. In 2017 The Island Trust took over the good works of Cornubia and the Bristol Channel Pilot Cutter Trust to grow this acclaimed service. 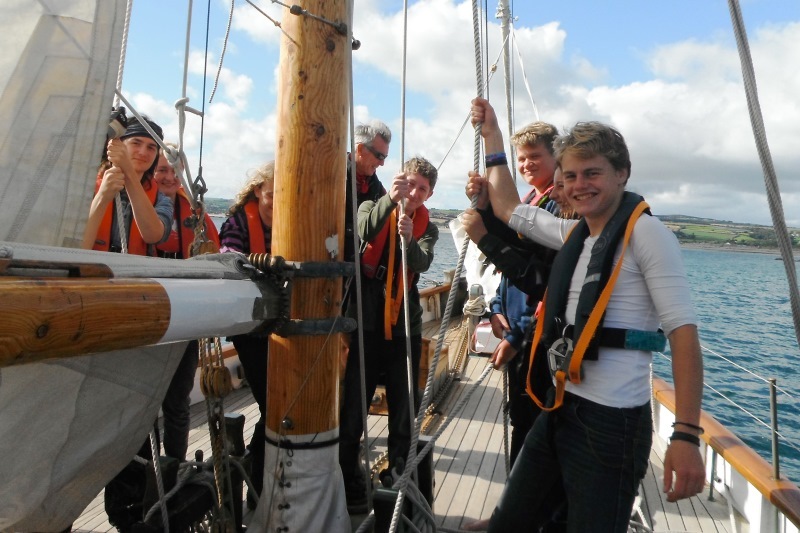 If you wish to discuss the possibility of bringing your group on an Island Trust sail training residential or day sail please get in touch by telephoning 01752 823007. We raise funds to support this work and offer bursaries for young people who fall into this category from The Island Trust Fund. All voyages are operated by The Island Trust’s trading subsidiary Island (Cutter) Ltd.
Crewed by professional sailing staff, qualified at the highest level, all of our vessels have been coded by the Maritime and Coastguard Agency (MCA) and inspected for seaworthiness and safety. Full time and relief staff are Royal Yachting Association (RYA) Yachtmasters and Cruising Instructors or higher, and volunteers are qualified to levels appropriate to the responsibilities they carry in accordance with statutory MCA and RYA regulations and guidelines.